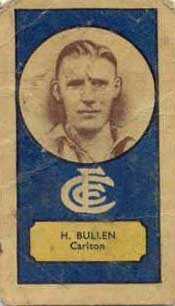 Perhaps our second most famous 'Horrie' after the great Horrie Clover, Bullen played 59 games across the mid-1930's. Bullen was born in Doncaster. He passed away on the 7th November, 1961 aged 55. "Bullen, a Doncaster player of the vigorous type, whose services have been sought by several League clubs." Horace Bullen was cleared to Somerville during 1935 and debuted in the blue and gold of the Mornington Peninsula club on June 14. Horrie was still playing for Somerville in 1939 and was named best player for the club in the loss against Hastings-Tyabb, May 20. "Horrie, though past his prime now, plays for the love of the game, and is to be congratulated on his fair play and good sportsmanship." Of quite hefty build at 185cm and 91kg, Horrie Bullen failed to establish himself during his first stab at league football with Hawthorn in 1926. After managing just 2 senior games for the year he quit the VFL scene to join Doncaster, where he spent the next five seasons. Contributors to this page: Jarusa , molsey , Bombasheldon , blueycarlton , tmd1 , p(12)terg , true_blue24 , nikki and admin . Page last modified on Tuesday 16 of May, 2017 22:31:58 AEST by Jarusa. 1973 - Owen Backwell (father of future Blue Brett).